COOL VIBES IN SOFI – MARRIOTT STANTON S.B. Situated away from the throngs of tourists that set upon Miami Beach is the quieter yet luxurious enclave in South Beach, known as the SoFi neighborhood. At the heart of this peaceful oasis is the Marriott Stanton South Beach – an oceanfront property surrounded by the best shopping, dining and nightlife the city has to offer. Their spacious guest rooms evoke that cool Miami art deco vibe adorned with locally inspired art and furnishings, which all include a private balcony overlooking either the Miami skyline or the Atlantic Ocean. Enjoy the white sandy beach as your backyard or take a dip in the cool waters by the recently renovated and landscaped pool area. While there are no shortage of prime eateries in South Beach there are plenty of dining options in the hotel and steps away in this vibrant neighborhood. Deco Blue Restaurant & Lounge is located on the oceanfront by the pool, giving guests an amazing view of the sunset with an option to dine alfresco to enjoy the ocean air. Operating from sunrise to midnight, guests can satisfy their palette with a diverse menu ranging from hamburgers to sushi rolls to tuna tostadas and BBQ ribs. In between dips at the pool, enjoy a tropical cocktail to liven up your Miami experience at The Spot that also serves a light tropical bites such as fresh ceviche, tuna poke, Cuban sandwiches, and a variety of tasty wraps. The hotel’s newest restaurant addition is Lolo’s Surf Cantina helmed by Chef Richard Ampudia- the man behind La Esquina in NYC. Lolo’s vibrant contemporary Mexican menu is inspired by his late grandmother’s spirit of vivacity and joy. Ampudia brings his revered Mexican street food style to Lolo’s and paired with his strong fresh juice margaritas, this is a perfect combination to fuel a night out. For authentic Southern Italian fare in SoFi dine at the sprawling 12,000 square foot Cibo Wine Bar South Beach, which serves delicious rustic Italian cuisine in a modern industrial atmosphere. Dine alfresco by candlelight from their sumptuous rooftop terrace lounge or enjoy an intimate tasting in their wine cellar dining room surrounded by bottles of Barolo. Executive Chef Massimo Giannattasio hails from Salerno, Italy. He has brought his passion for Italian cuisine and culture stateside and worked at some of the top kitchens in Los Angeles and Miami while developing a loyal following who come for his culinary masterpieces. 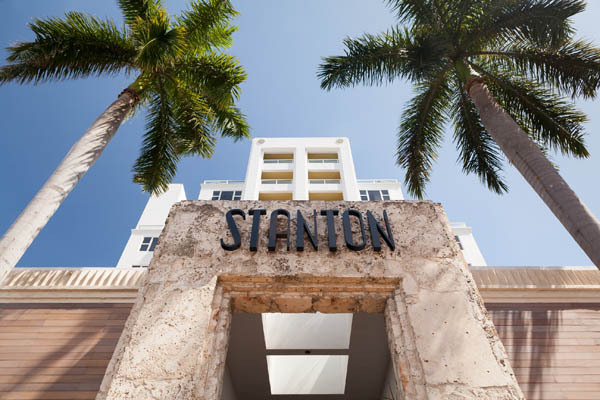 Whether you’re hoping to escape from the chilly winter days or party all day and night, The Stanton is the perfect respite to get away from it all yet still be in the center of action.